First of all, I need to make a statement, and that statement is as follows: If you don’t like Queen, there is something wrong with you. Second on our agenda, I’d like to send a big old “thank you” to my dad. I informed him of my need to listen to a band for every letter of the alphabet, and he used his final Dad Rock Tuesday pick to help fulfill that obsessive-compulsive desire. Selfless. Thirdly, I realize that today is Day 365. I know that I’ve alluded to this very moment for ages, and, yeah, the site’s tagline is still “365 days, 365 albums.” However, I’d hate myself forever if I passed up the opportunity to post on Leap Day. Yup, you’re going to have another one of these to get through tomorrow. You can do it — I believe in you. Now, without further ado, I present to you . 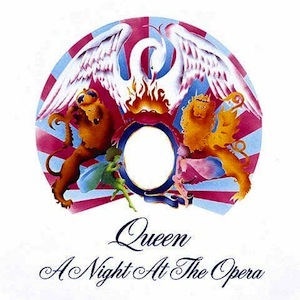 . .
You know things are kind of messed up when you can begin listening to a Queen record, and—without irony—think to yourself that it sounds a whole lot like Foxy Shazam. For once, I must give my father props. Whether he realized it or not, he did some serious ejuhmuhkatin’ with his pick this week. See, I’ve never listened to a full Queen record before. Sure, I had one of those Greatest Hits comps on my iPod Mini seven years ago, but we all know those don’t (usually) count. Between that and a few viewings of Ella Enchanted, I thought I knew Queen. Pshh. It’s great to hear something like A Night At The Opera because it really gives a much better picture of the band and its music than any singles collection ever could. Most of these songs weren’t tailored for the radio, and Queen takes a few artistic liberties that I never would have expected. Whether busting out a ukulele, or putting on minute-long, song-ending, falsetto-filled acapella sections, Mercury and company never fail to keep things . . . interesting. No, it doesn’t all work, but the faults definitely don’t outweigh the triumphs on A Night at the Opera. It’s both the successes and failures that give records their personalities, and make us listen to the exact same 40-or-so minutes of music again and again and again.